This week has been a little crazy so I haven’t had time to address The Great 47% Explosion. 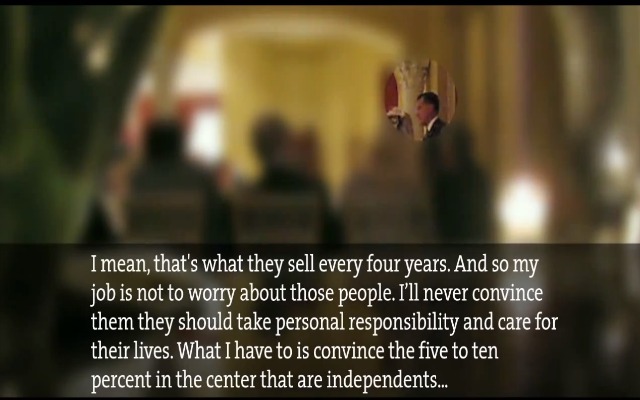 Mitt Romney was speaking to a private, closed-door, $50,000-a-plate dinner and someone snuck in a video camera and secretly recorded it. At this private event, he said that 47% of people do not pay federal income taxes and those people all feel like they are victims, they all feel entitled to everything and they refuse to take personal responsibility for themselves. There are 47 percent of the people who will vote for the president no matter what. All right, there are 47 percent who are with him, who are dependent upon government, who believe that they are victims, who believe that government has a responsibility to care for them, who believe that they are entitled to health care, to food, to housing, to you name it. That that’s an entitlement. And the government should give it to them. And they will vote for this president no matter what. And I mean, the president starts off with 48, 49, 48—he starts off with a huge number. These are people who pay no income tax. Forty-seven percent of Americans pay no income tax. So our message of low taxes doesn’t connect. And he’ll be out there talking about tax cuts for the rich. I mean that’s what they sell every four years. And so my job is not to worry about those people—I’ll never convince them that they should take personal responsibility and care for their lives. So, let’s cover the factual nature of the 47% comment: Yes. It’s true. This statistic OFTEN gets misquoted, but Romney used it correctly here. Many conservatives in Congress and in the media say that nearly half of Americans “do not pay taxes” which is FALSE but when you change it to “do not pay FEDERAL INCOME taxes” then it is correct. Most of the 47% DO pay taxes. Social Security Taxes. Medicare Taxes. Sales Taxes, etc., but they don’t pay Federal Income taxes. Those within the 47% that do not pay any taxes at all generally fall into these categories: Elderly, Young just out of school, and Military serving active duty. Half of Americans are NOT lazy, entitled, and irresponsible and guess what? Millions of people in that 47% are Republicans who will vote for Mitt Romney. Beyond the incredibly insulting statements, one of the things that really irks me is the utter hypocrisy of the statements. Firstly, when Mitt Romney was asked over and over for his Tax Returns he has refused to release them but he has assured us that he has paid taxes but never more than he needs to: “I pay all the taxes that are legally required, not a dollar more.” So, when Romney pays as little as he can within the law that’s good and right, but when the 47% pay exactly how much they owe according to the law then they are entitled, irresponsible freeloaders. Jackass. Check out the full, unedited video here.